It is the central question in quantum mechanics, and no one knows the answer: What really happens in a superposition—the peculiar circumstance in which particles seem to be in two or more places or states at once? 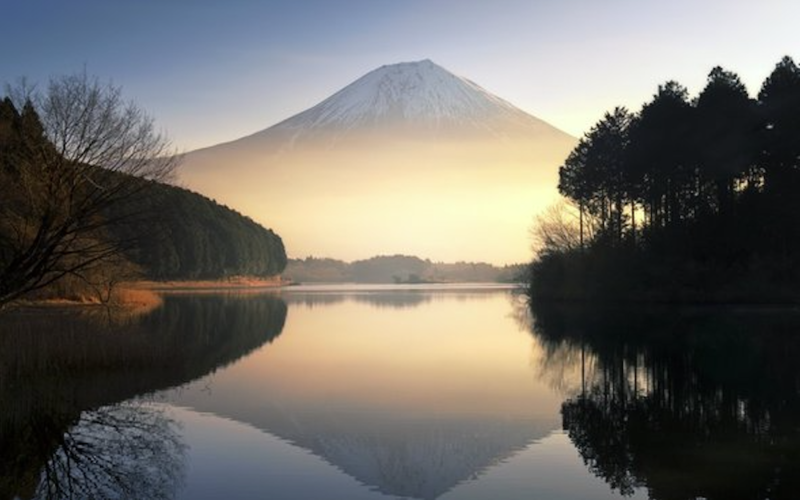 Now, in a forthcoming papera team of researchers in Israel and Japan has proposed an experiment that could finally let us say something for sure about the nature of this puzzling phenomenon. The classic example of a superposition involves firing photons at two parallel slits in a barrier. One fundamental aspect of quantum mechanics is that tiny particles can behave like waves, so that those passing through one slit “interfere” with those going through the other, their wavy ripples either boosting or canceling one another to create a characteristic pattern on a detector screen. The odd thing, though, is this interference occurs even if only oneparticle is fired at a time. The particle seems somehow to pass through both slits at once, interfering with itself. That’s a superposition. For decades researchers have stalled at this apparent impasse. They cannot say exactly what a superposition is without looking at it; but if they try to look at it, it disappears. One potential solution—developed by Elitzur’s former mentor, Israeli physicist Yakir Aharonov, now at Chapman University, and his collaborators—suggests a way to deduce something about quantum particles beforemeasuring them. Aharonov’s approach is called the two-state-vector formalism (TSVF) of quantum mechanics, and postulates quantum events are in some sense determined by quantum states not just in the past—but also in the future. That is, the TSVF assumes quantum mechanics works the same way both forward and backward in time. From this perspective, causes can seem to propagate backward in time, occurring aftertheir effects. Take, for instance, a version of the double-slit experiment devised by Aharonov and co-worker Lev Vaidman in 2003, which they interpreted with the TSVF. The pair described (but did not build) an optical system in which a single photon acts as a “shutter” that closes a slit by causing another “probe” photon approaching the slit to be reflected back the way it came. 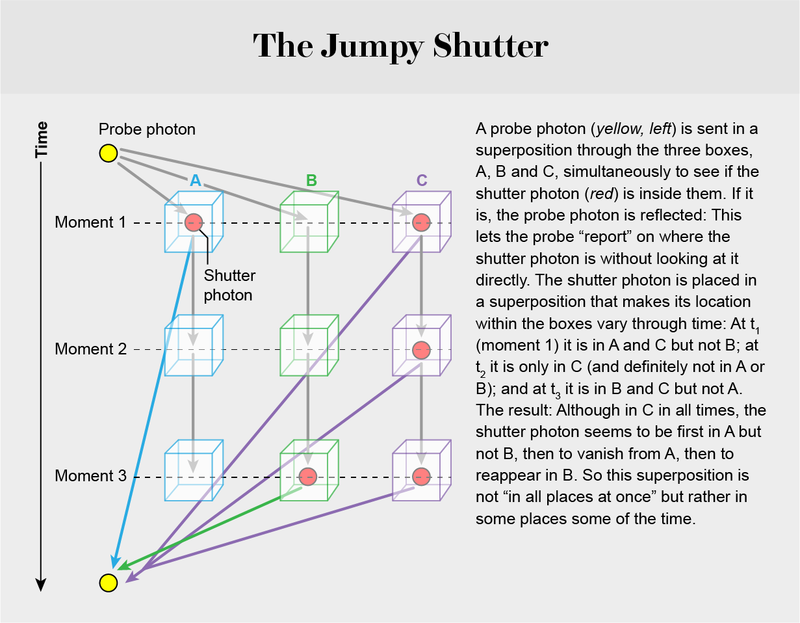 By applying post-selection to the measurements of the probe photon, Aharonov and Vaidman showed, one could discern a shutter photon in a superposition closing both (or indeed arbitrarily many) slits simultaneously. In other words, this thought experimentwould in theory allow one to say with confidence the shutter photon is both “here” and “there” at once. Although this situation seems paradoxical from our everyday experience, it is one well-studied aspect of the so-called “nonlocal” properties of quantum particles, where the whole notion of a well-defined location in space dissolves. In 2016 physicists Ryo Okamoto and Shigeki Takeuchi of Kyoto University verified Aharonov and Vaidman’s predictions experimentallyusing a light-carrying circuit in which the shutter photon is created using a quantum router, a device that lets one photon control the route taken by another. “This was a pioneering experiment that allowed one to infer the simultaneous position of a particle in two places,” says Elitzur’s colleague Eliahu Cohen of the University of Ottawa in Ontario. Now Elitzur and Cohen have teamed up with Okamoto and Takeuchi to concoct an even more mind-boggling experiment. They believe it will enable researchers to say with certainty something about the location of a particle in a superposition at a series of different points in time—before any actual measurement has been made. This time the probe photon’s route would be split into three by partial mirrors. Along each of those paths it may interact with a shutter photon in a superposition. These interactions can be considered to take place within boxes labeled A, B and C, one of which is situated along each of the photon’s three possible routes. By looking at the self-interference of the probe photon, one can retrospectively conclude with certainty the shutter particle was in a given box at a specific time. That richness, Elitzur and colleagues argue, is what the TSVF gives access to. The apparent vanishing of particles in one place at one time—and their reappearance in other times and places—suggests a new and extraordinary vision of the underlying processes involved in the nonlocal existence of quantum particles. Through the lens of the TSVF, Elitzur says, this flickering, ever-changing existence can be understood as a series of events in which a particle’s presence in one place is somehow “canceled” by its own “counterparticle” in the same location. He compares this with the notion introduced by British physicist Paul Dirac in the 1920s who argued particles possess antiparticles, and if brought together, a particle and antiparticle can annihilate each other. This picture at first seemed just a manner of speaking but soon led to the discovery of antimatter. The disappearance of quantum particles is not “annihilation” in this same sense but it is somewhat analogous—these putative counterparticles, Elitzur posits, should possess negative energy and negative mass, allowing them to cancel their counterparts. So although the traditional “two places at once” view of superposition might seem odd enough, “it’s possible a superposition is a collection of states that are even crazier,” Elitzur says. “Quantum mechanics just tells you about their average.” Post-selection then allows one to isolate and inspect just some of those states at greater resolution, he suggests. Such an interpretation of quantum behavior would be, he says, “revolutionary”—because it would entail a hitherto unguessed menagerie of real (but very odd) states underlying counterintuitive quantum phenomena. The researchers say conducting the actual experiment will require fine-tuning the performance of their quantum routers, but they hope to have their system ready to roll in three to five months. For now some outside observers are not exactly waiting with bated breath. “The experiment is bound to work,” says Wharton—but he adds it “won’t convince anyone of anything, since the results are predicted by standard quantum mechanics.” In other words, there would be no compelling reason to interpret the outcome in terms of the TSVF rather than one of the many other ways that researchers interpret quantum behavior.